Steins;Gate Review | Nerd Much? If you had the ability to change the past or future, would you do it? The world as we know it isn’t the only universe we live in. The choices we make and the events that make up our lives can very well set the future. Choosing whether or not to do something must have an alternate path (the choice you did not select). What if we had the ability to alter a choice we made? In the world of Steins;Gate, this conundrum is heavily explored. Is the future really set in stone? Steins;Gate, originally released for the Xbox 360 in Japan in 2009 by 5pb games, is a sci-fi visual novel game in which players take on the role of a college student/mad scientist, Rintarou Okabe, and his accidental discovery of the manipulation of time and space through the sending of text messages to the past. Throughout Okabe’s journey, his friends (otherwise known as Future Gadget Lab members) are able to try and change something about their past that will inherently effect the future. At first, everything seems like a plausible change, until divergence starts to drop and the future of the world is at stake, pointing to one time travel research organization, SERN. We’ve all heard of time travel stories before. From Back to the Future to Somewhere in Time, it isn’t a new idea. However, time travel stories can be made into something new, inventive, and go beyond what’s already out there. Steins;Gate does exactly this, paying homage to several science fiction tales while crafting a masterpiece of its own. After the release of the popular anime series and movies, the game was released in America for the PC in 2014, and was met with critical acclaim. This year, Steins;Gate is being rereleased for the PS Vita and PS3 in the US. The European release was in May, and I was able to purchase the “El Psy Congroo” edition for Vita in order to review it now. The game does not have a difference between regions, and is set to be out August 25, 2015 in the states. Steins;Gate is certainly a title to be remembered and cherished for years to come, having several elements that make it into one of the best games and stories of all time. Picture a hot summer day, cicadas buzzing, and the bright sun shining through the window and onto the wood floor. The setting is a non-air conditioned apartment, in the middle of Akihabara, Japan, located right above an old television shop. This is no ordinary apartment, as it is the Future Gadget Lab, the home of many scientific experiments. You set out of your house, leaving your trusty friend to tend to the lab while you attend an educational science convention that’s a class requirement. Your best friend from childhood joins you, and soon events lead you to a genius girl from America, Makise Kurisu. She is set to make a presentation on her latest research on time travel. Moments later, you hear a scream and she is left in a pool of blood. Unsure of what just happened, you text your friend Daru in a panic. Whatever just happened was somehow reversed, and that same girl shows up to the lab a few hours later. This sets off the events of the discovery of time travel, love, and loss, both the hardest and most precious moments of your entire life. The story revolves around Okabe and his friends involvement and discovery of the Phone Microwave, a device that has the abilities to send text messages into the past to change the future. Between that and the research into SERN, a government organization with a shady track record, Okabe and his friends soon realize that they have gone into a position of no return. The happy, low key summer days spent with lab members are soon turned into races against time, a struggle between life and death. Is someone’s death always set in stone or can it be changed? Fate is battled constantly in the world of Steins;Gate, and it is an emotional ride that causes the players to question if it is something one person can overcome. Can love transcend time and space? One thing is for sure, time travel is a not something to mess with, and by the end of this story, you may think twice about how awesome it would be to go into a Tardis and travel back in time. The story is convincing. There is no doubt that a scientific explanation for time travel is a hefty subject to tackle as a writer, but it somehow all makes sense. I have learned more about quantum physics from this game than I ever did in any of my science classes in both high school and college. The game is full of complex theories that are presented in a unique fashion. If you are a science enthusiast, you may understand everything that is said by the characters. However for those who are unfamiliar with physics, the game it defines these theories when they are spoken of in the form of a dictionary that can be accessed by the main menu screen. The game will challenge you to think about what these theories mean so that they can be applied to the story’s narrative. It’s much more fun that it sounds, and is by all means an innovative way to combine a video game and education. This being said, much of the narrative is focused on the existence of several worldlines, or universes that are measured by divergence. Each time the past is changed, the worldline changes as well, causing a shift into another universe that was altered by the butterfly effect. This is an interesting concept that goes beyond the generic physical time travel trope that only effects one world. In this story, the world branches off depending on what is changed from the D-Mails, or text messages to the past. Instead of focusing on sending someone’s physical body from the past or future, data is sent through both messages and memories. There is also physical time travel, but it really is notable how every form of time travel is presented. Along with a convincing story, the game features a unique cast of characters that each play a part in making up the complex and intelligent story. Each character has a definite role that is never overshadowed or made insignificant. Rintarou Okabe is the main character and the role the player must take on in the story. Okabe is not only a protagonist with one of the best personalities in a visual novel, he is both complex and multifaceted. He is not “perfect” by any means, but that’s part of what makes him so likeable. Okabe has two personalities, his “usual self” and his mad scientist persona “Hououin Kyouma”, a nickname he came up with simply because it sounds cool. Like most of the characters in the story, Okabe is very nerdy, often circling the forums on @channel (the games take on Japanese website 2channel) and naming the gadgets he makes after his favorite animes. The way Okabe interacts with the other characters is very unique and unpredictable. He often mentions being targeted by the “Organization”, a fake threat he believes that is his mortal enemy. He talks to people like they are his minions, especially taking a liking to Makise Kurisu, referring to her as his “assistant” or “Christina”. Despite his outlandish behavior, Rintaro Okabe is actually a very caring person, doing anything to protect the ones he loves. Over the course of the game, his character develops tremendously, especially when fighting the battle of fate, doing anything to prevent the death of one of his closest friends. Okabe tries numerous times to stop what happens, but is met with immense despair and emotional trauma, putting himself in a position in which he ultimately feels hopeless. At some points in the story, Okabe seems to develop a mental illness due to everything he has been through, especially in one ending. Unlike many anime protagonists, Okabe is definitely not a Mary-Sue. He loses and loses again, pushing himself to extraordinary boundaries to achieve a worldline in which no one is met with death. Makise Kurisu is the genius scientist girl from America visiting Japan for an academic conference. She is no doubt one of the strongest female leads of all time. Kurisu is independent, intelligent, and an established figure in the scientific community. Her character is considered a tsundere, which in Japanese culture and anime, refers to a type of character who acts cold and mean to others, but feels the opposite inside. In many ways, Kurisu puts up a front in order to hide her true feelings to others, especially Okabe. For example, she claims to just be visiting the lab to waste time before she travels home, but seems to really enjoy performing experiments and spending time with everyone. Kurisu is also a nerd, like much of the other cast members, and is often embarrassed when people call her out on it. She forms a special connection with the protagonist over the course of the entire game, being the one there to help him whenever he fails. The best thing about this is that Kurisu is not simply a side female support character. Without her, many of the experiments would have not come to life. Her help was needed as Okabe realized that he could not go through his ordeals alone. She is respected and is necessary to the story. Her ending leads to the “true ending” of the story which is the full explanation of events and the best conclusion to Steins;Gate. Getting her ending isn’t easy, but is absolutely worth it for such a great character. Kurisu is not the only strong female character in the series, as the lab members are actually comprised of mostly females. Each of these characters are strong and have great qualities that many other games lack. Females in this game are not “useless side characters”, they each have a purpose that fits into the main story. They are not just love interests, for they are much more than that. Mayuri Shiina, for example, is Okabe’s dearest childhood friend who is a very optimistic and cheerful girl who worries about drifting away from him. Her role in the story is very significant and she is not written off as the typical best friend. Mayuri works at a maid café under Faris Nyannyan, a maid who loves everything that is cute, acting like a cat, and is popular in Akihabara. Faris also is multidimensional, having deeper concerns under her friendly exterior. Other characters include the strong and highly important part timer Suzuha Amane, transgendered female and shrine maiden Ruka Urushibara, the mysterious and quiet reported Moeka Kiryu, and Okabe’s best male friend and funny neckbeard shut in, Daru Hashida. Faris, Suzuha, and Ruka each have their own chapters that branch off into each of their respective endings. The chapters reveal so much about their characters and develop them no matter if the player chooses to continue towards the true ending or see their respective endings. The best thing about this is that each character offers a different perspective and unique end to the tale. Mayuri and Kurisu’s endings work a little bit differently, and will take some effort to achieve both. Not counting the story and amazing characters, one thing that makes the game so amazing is it’s setting. Akihabara is a unique place, as it is the “otaku” and electronics district in Japan, having many distinct and unique stores that cannot be found anywhere else in the world. Many of the actual buildings, stores, and events are mentioned in the game, making it an accurate and realistic world. Since the setting is in the otaku district in Japan, many of the characters are nerds and are into science fiction and pop culture, many times mentioning popularized internet memes or quotes from animes or shows. This only adds to the charm. If you’re not into anime or did not catch that Back to the Future reference, the game defines the terms for you in the dictionary. This is an interesting addition to the game, and is great for newcomers into the visual novel genre. It is rated M for Mature for a reason, but it also is geared towards an older audience. There is no “action” in terms of fighting or violence or risque scenes that are flagged by those who rate video games. It is a long story with heavy emotional scenes, which may seem boring to younger players. All of the scientific concepts may be tough to take in for younger players as well, which is why it is for more of an adult audience. This is something to keep in mind if thinking of purchasing this game. Although, younger players still can fully enjoy the story just like anyone else. Everything about the story is charming, giving the player an amazing feeling no matter what scene they are in. It’s not predictable by any means, as there are many twists and turns combined with scenes and dialogue that will put a smile on your face. Whether it is a sad or a happy moment, the players will be drawn in by the complex and well thought-out narrative, only to be truly satisfied by the conclusion of the story. Although it has a well written narrative, Steins;Gate isn’t a game in the usual sense. There isn’t a leveling system, open world gameplay, or weapons involved. It’s a story, directed by player choices. That being said, this isn’t really a “game”, it’s a visual novel. Imagine having a book in front of you, only there are portraits of the characters, voice acting, music, backgrounds, and objects to look at. This being said, there is a lot of reading to be done, 30 to 40 hours to be exact. If you are not a fan of books, Steins;Gate may or may not be a game for you. The visual novel style may appeal to those who are uninterested in just “text”, because there are environments and characters to look at. However, those who are not fans of reading may feel a bit bored. If you are looking for a combat system, this isn’t the PS Vita game you’ve been waiting for. Steins;Gate, in many ways, is like an interactive movie without animated cutscenes. You, as the protagonist, get to choose what paths to take through text messages, which is an interesting and innovative concept. 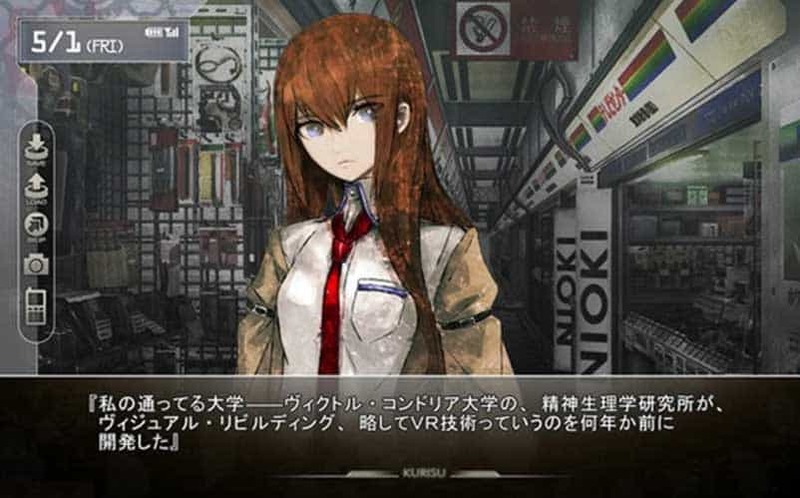 Many visual novels are based on dialogue choices, but Steins;Gate stands out from these titles, since every choice is based what the player chooses to send on their in-game phone. This makes for a unique experience for any gamer. That being said, players can choose to ignore or answer phone calls, select words from a text message in order to respond, or send D-Mails to the past. Although this is fun and adds a few more scenes, there is no easy way to tell which is the right answer. The route to the true ending has flags based on texts you send. If you select the wrong word or do not respond to a certain message, then a flag can be missed, resulting in a much more disappointing ending than you may have wanted. If players wish to get to the true ending and/or see all of the endings, it is heavily advised to seek out a game guide, which can be found online. Although the game has a very high level of replayability, redoing an entire chapter is not the most ideal, especially if you just played through the entirety of the game. This is probably one of the only flaws Steins;Gate has, but can be avoided through the use of a guide. The music and background effects in the game fit the entire setting of Steins;Gate perfectly. The opening songs before the main menu screen are absolutely fantastic themes that set the story to come. When playing the game, players will notice quirky, unique background tracks that contribute to the “mad scientist” vibe. Players can also set text tones and message tones for a more personalized experience. In game soundtracks are forever associated with the scenes. For example, if you have just played through an emotional scene and “Gate of Steiner” was playing, you may actually feel emotional while listening to it later, which means it is very impressionable. The voice acting is very great but is only in Japanese with English text. This results in much more reading than if it were dubbed in English. Some people may not like this, especially if they do not understand what is being said. However, despite a language barrier, the player can still feel the emotions through character dialogue. Graphics consist of anime style character portraits and an interesting color scheme. Backgrounds are well drawn and the characters have a unique style that is different than a lot of Japanese styled art. The only thing that would have benefited this game would be animations for important cutscenes. However, the story and environment is so convincing the game doesn’t necessarily need that. Steins;Gate is a masterpiece of a story that appeals to a multitude of people who are fans of anime, time travel, science, and well thought out universes. The wide appeal results in Steins;Gate that can be recommended for any nerd who has ever been interested in time traveling altering the past and future. Although it is set in Japan and has a distinct anime style, non-fans are welcomed and are cued in through defined terms and explanations. Steins;Gate is heavily based on real scientific theories and pop culture, making it a realistic representation of a fictional story. It features several characters, all which are memorable and strong, serving a unique purpose in the narrative. The story of Steins;Gate will make you feel a vast array of emotions that will rip your heart into shreds, only to build it back up again. This being said, Steins;Gate is narrative heavy and is like reading a satisfying book you never want to put down. However, despite being released on consoles, Steins;Gate is a visual novel with little to no gameplay, which for some is not ideal. It is a big time commitment of around 30-40 hours for every ending and is well worth it. El Psy Congroo. This is the choice of Steins;Gate. Pre-Order Steins;Gate on PS Vita here.